Making the Institute: 3 Conversations, a day-long event to take palce this Friday, April 26, 2013 will be hosted by UCSC Arts Dean David Yager and John Weber, the Institute’s newly-hired founding director. The day will begin with a keynote address by Walter J. Hood, an award-winning landscape architect and urban designer with an international reputation for his pioneering work in environmental design. Hood is currently professor of landscape architecture & environmental planning and urban design at UC Berkeley and principal of Hood Design in Oakland, CA. His projects are noted for their fusion of design excellence with community-based planning. “One of the great things about his work is that he tries to build community using space and architecture,” noted Dean Yager. Hood’s notable projects include the grounds for the new M. H. de Young Museum in San Francisco in collaboration with Swiss architects Herzog & de Meuron (2005) and the award-winning Solar Strand in New York (2012). “This school has a great tradition of interdisciplinary teaching and research, and so for this conversation we have invited people like emeritus humanities professor Jim Clifford, one of the founding voices of that tradition at UCSC,” said Weber. Clifford will be joined on the panel by UCSC astrophysicist Enrico Ramirez-Ruiz, a co-founder of UCSC's Open Lab, an art/science collaboration; Kim Yasuda, co-director of the University of California Institute for Research in the Arts; and Marina McDougall of San Francisco's Exploratorium. Dean Yager will serve as moderator. The second conversation is titled “Envelope, Contents, and Community” and will be moderated by Connie Wolf of Stanford's Cantor Arts Center, who was formerly founding director of the Contemporary Jewish Museum. It will explore how museum architecture intersects with landscape design, programming and audiences. Other participants in this conversation will include Walter Hood, architect Teddy Cruz of UC San Diego, and artist Harrell Fletcher of Portland State University. The third conversation, “Presenting in the Academy,” will include Kristy Edmunds, director of UCLA's Center for the Art of Performance, along with Lawrence Rinder, director of the Berkeley Art Museum. For the complete conference schedule, visit the Arts Division web site or call (831) 502-7252. 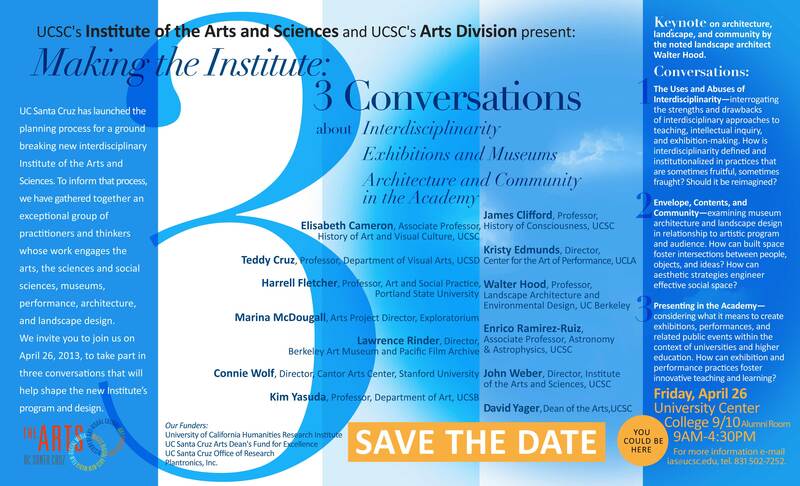 Making the Institute: 3 Conversations will take place on Friday, April 26, from 9 a.m. to 4:30 p.m. on the UCSC campus in the Alumni Room of the University Center. Admission is free, and the public is invited. This event is sponsored by the University of California Humanities Research Institute, UC Santa Cruz Arts Dean’s Fund for Excellence, UC Santa Cruz Office of Research, and Plantronics, Inc. For more information, visit the Arts Division web site or call (831) 502-7252.